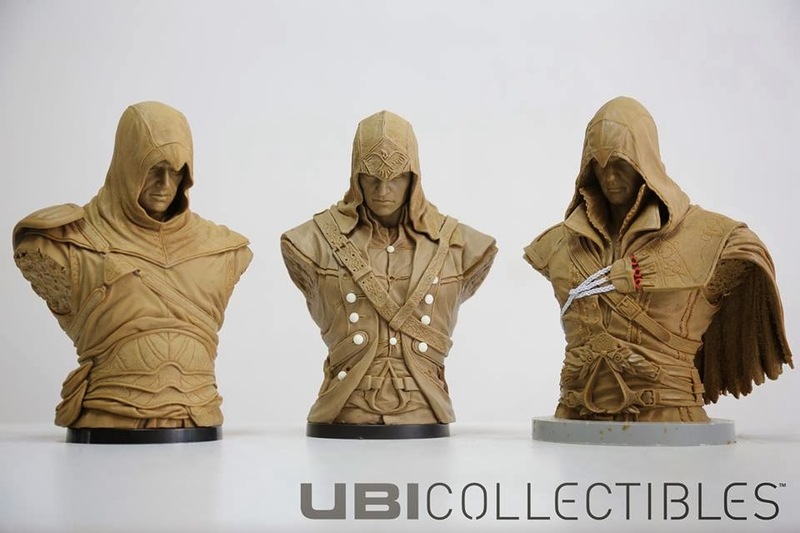 Dr Jengo's World: Assassin's Creed Busts revealed? Spotted this on the CE forums that was posted on the UbiCollectibles Facebook page..
(They are only brown prototypes, the final busts would be coloured)"
No idea how big the busts will be, but judging from this pic, they look to be small. Well not really small but not the 1/2 or 1/3 scale that I would like them to be. My initial thoughts? What's the reason for this if they are going to be small? We already have the figures from UbiCollectibles. Judging from those, the face sculpt aren't exceptional so these busts aren't going to be stunning either. But like what Dan Platfus from the CE forums said to me: "To be honest, we know you will get them anyway". Haha, well he's right! I will probably get them anyway. At the moment, I'm not getting very excited about these but they will still make for a cool display. Imagine if they make all the Assassins in this Bust form. (Keyword here is 'all'.) I'm still upset about a lack of a Aveline or Desmond figure from UbiCollectibles so I'm not too confident we will see all the Assassins as Busts. But, if they do make all the Busts in the same scale with consistent bases, it will be really nice to display them all side-by-side above all my other Assassin's Creed figures. As some of you know.. my biggest issue with the UbiCollectibles AC figures are that all of them aren't in the same scale so it looks rather weird displayed together. However, if they do the busts in the same scale, then it will be perfect!